Do you have a business and need to send out postcards for promotions? This would be a great giveaway to enter. Create these online and they mail them to you. You would then stamp them and send them out to potential customers. I am still trying to figure out what I want mine to say. I may just add my family picture and write merry Christmas on the back. 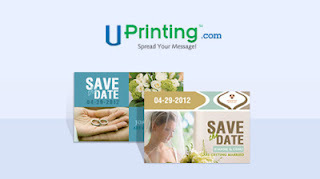 Great for a wedding save the date card as well as an invitation to a birthday party or event. The ideas are endless. This is an idea of what You can do with the post cards if you won. Makes a very Nice Christmas card that you do not have to put in an envelope. Stamps for post cards are much less also. Prizes are sent within 15-30 days after the post goes live. I think I'd use the postcards and business cards from the Uprinting site! The Envelopes with our return address on them would be great to have! Thanks I see you were finally able to enter. I had to mess around with fixing it a few times to finally get it going. We've gotten these postcards before and LOVE them! I also love their notecards. They are really high quality and super cheap!